The US Central Intelligence Service stands behind the targeting of the UN humanitarian convoy near Aleppo, according to the statement of Syria's Defense Ministry. MOSCOW (Sputnik) — Syria's Defense Ministry believes the recent attack on the UN humanitarian convoy near the city of Aleppo was planned by the United States to divert attention from the deadly strike on Syrian forces by the international coalition's aircraft, its press office told Sputnik Friday. “It has become clear that the US Central Intelligence Service stands behind the targeting of the UN humanitarian convoy near Aleppo… The basic aim of targeting the aid convoy was to conceal the blatant attack of the US-led coalition on Syrian Arab Army’s positions and to draw the attention of the media and global public opinion from this condemned act, which openly demonstrates the US support for IS terrorist group,” the press office said. It stressed that the attack had been planned in order to help Daesh take control over new areas following the gains of the Syrian army in Aleppo. "All this rules out the claims that the Russian aircraft had been responsible for the attack, especially, the statements by one of Nusra Front terrorist group’s leaders confirm that terrorists backed by Washington carried out that immoral act," the ministry concluded. On September, 17 the coalition aircraft killed dozens of Syrian soldiers in Deir ez-Zor province, later claiming it had occurred by mistake. 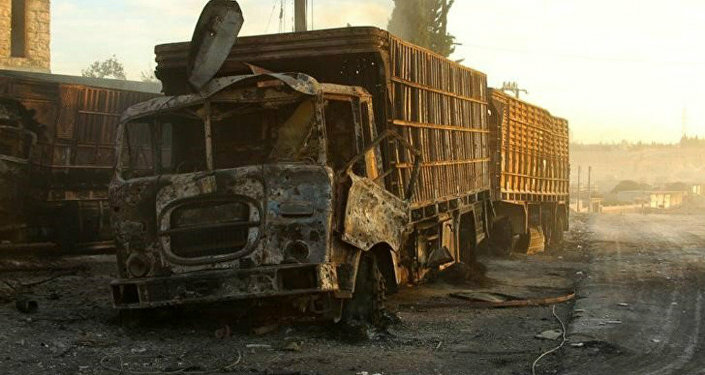 In a couple of days a convoy driving humanitarian aid towards the northern city of Aleppo was attacked, with Washington immediately blaming it on Russia, though the independent investigation had not been completed yet.